Angular 6 @input() set() is not working. Is there a way to make it work? How can I pass a HashMap<Integer, MyObject> into HashMap<Integer, Object>? how to read n number lines from console? How can i print specific values from an ArrayList given another Arraylist? I am trying to create a Java program that takes a users string input and translates it into morse code. I am attempting to store each letter of the alphabet in a hashMap with its corresponding morse code & my goal is to be able to get the value (morse code) when the key(regular letter) is read from the input. Ive attempted something below but it keeps printing null when I test it out. I am fairly new to java and can't seem to figure out how to do this. or any other method of iterating single characters from the user's input. Your code is printing null because this line String val = (String)morsecode.get(sc.nextline()); is retrieving the String value of, according to your comment, the String "ab". According to how you're adding entries to the HashMap, you do not add "ab" but instead add the individual letters "a" and "b"; you're asking the HashMap for something you never gave it. Below, I've added a translation step for what I think you're trying to do. The small block near the end will pull each translation you gave the HashMap and build a new String for every letter in the English sentence you gave the program. I'm attempting to understand HTML use in C and was wondering if it was possible to implement a c program that takes bash like input from the user on a local host html page into a text box and then sends this input after the click of a button to this c program that will execute the user's commands and output the results. Example of the server / web page below along with the program desired to be embedded into this server. All code compiles and runs correctly so no need to shift through it for bugs, my question is if its possible to embeded pexec.c into WCServer.c in order to run pexec with user input from the localhost html page of WCServer.c and how this could be done. and assigning to a local variable. This butnDisabled variable continuously checks for required form fields and returns true or false. It's returning different boolean values but @Input is not capturing them. Can anyone suggest a way to get continuous input using the @Input tag? "Your object did not react to any of the buttons I pressed to change the camera view! The object of this project is to have the user control the camera by being able to change different views but your object didn't give me that ability!" I currently have it coded to zoom in on the object when pressing the up key and out when pressing the down key. The camera view is supposed to move up and down when moving the mouse. I've tried using some previous code that involved the cameraPosition variable, but it does not function properly when utilized in the pressSpecialKey function or in the rendering function. glm::vec3 cameraPosition = glm::vec3(-2.0f, 1.0f, 2.0f); //Initial camera position. //Activate the Vertex Array Object before binding and setting any VBOs and Vertex Attribute Pointers. Expected: Spoon in center of the screen, mousemovement changes the camera view (horizontally and vertically), up arrow causes camera to zoom in, and down arrow causes camera to zoom out. Actual: Spoon not in center. Mousemovement causes the object to move (horizontally and vertically). Arrows not detected (?). I am trying to generalise one of my methods where a HashMap and a list of integers are given, and objects in the hashmap are returned if their key is in the given list if ints. ...it comes up as a wrong argument type on the first argument. How can I keep the method generic so that it can take any HashMap? I am trying to write demo code to show rehashing is happening in Hashmap when the map size exceeds the load factor threshold. How can I prove rehashing is happening internally . Also I want to prove that eventhough the old entries are moved to new buckets during rehash , I can get the old elements using the old key(Let me know my assumption is correct). Below the sample code. Read all lines from console and store in A collection. in this context how to use scanner's methods. The number of lines user may enter is unknown. How would one go about having the user inputted text equal to a string. If I input "January", I would like the if statement to run and print out "First". However, the else runs instead and "invalid" is printed out. I have also tried putting single quotes within double quotes just to see if it would work, but it prints out "invalid" as well. When I input "January" I expect the output to be "First", but it outputs "invalid". I wish to print out data from an ArrayList based on another ArrayList. So i have 3 ArrayLists. This list will contain every row&column from the csv whish is of interest to me. I have considered using HasMap for this purpose, but i'm more familiar with ArrayLists. The end result will hopefully use an SQLite connection to a DB. This input string "..-.----..-.-...---..-.--" should translate to "fox lazy", there can be multiple other translations possible, but this is one possible solution since these 2 words are present in the English dictionary. I wrote 2 functions, TranslateMorse and SegmentString. SegmentString splits an English string and finds all the meaningful words in the dictionary. For example if input is "foxlazy", the function can find "fox" and "lazy" are 2 meaningful words present in the dictionary. The TranslateMorse should actually translate the morse code input "..-.----..-.-...---..-.--" to "foxlazy" so that SegmentString gives the resultant output, but the tricky part is MorseCode translation is not straight forward and it gives me many translations. 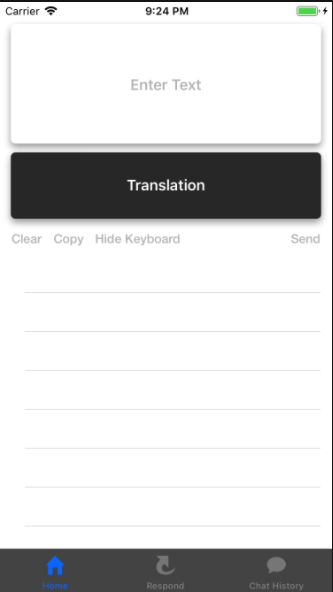 I am working on a school project for a “morse code communicator” type app where one types into the app in English and is returned with a translation in morse code on screen and in a table view you message is entered character by character. My thought is that when the user presses the send button after they have finished typing their message, the app will grab the top character from the table view, interpret what character it is, vibrate in morse code the correct letter that corresponds, and then remove it and move on to the next character. This is seems like a very hard thing to do, but this is what I need help with and if anyone could lead me in the right direction that would be much appreciated! Thank you! I am trying to create a program that converts a letter or number input by the user to morse code which then blinks an LED matching the output. I am getting the "Error enabling this function: Address exceeds the allowed range" message when looking at the debugging and am unsure of how to fix this. What do I need to do? I've tried looking the problem up and changing the value of the arrays doesn't seem to change the error.